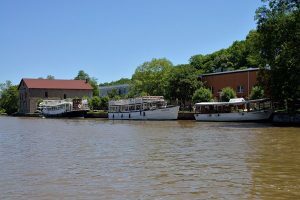 While the Erie Canal is busy celebrating its 200th birthday, Lockport Locks and Erie Canal Cruises is celebrating its 30th year of providing visitors to the Erie Canal a great opportunity to get out on the water on one of their cruise boats. In addition, if you’re looking for a venue for a company event or a wedding you won’t need to look any further. 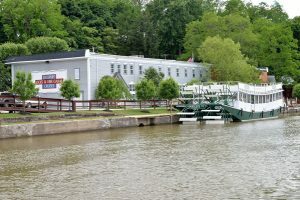 Lockport Locks and Erie Canal Cruises was started by Mike and Sharon Murphy back in 1987. They started with two pontoon boats and a dream. The business has been built to be one of Niagara County’s most popular tourist attractions, and with the acquisition of their property located at 210 Market Street in Lockport, the company can boast having one of Western New York’s most unique banquet and meeting facility. The main building, originally built in the 1840’s was renovated to resemble an 1800’s Canal Town and with over 100 windows overlooking the historic Erie Canal, the Canalside which is open year-round and houses banquet and meeting space for over 200, a café, gift shop and outdoor landscaped picnic area with 100’foot shelter that can accommodate another 300 people. The original stone walls are the remains of what was once Niagara Preserving Company one of the first companies to effectively preserve food in metal containers. The property at one time was also home to the Western Block Company, a business that manufactured block and tackle for pulleys used on canal boats. Many of the original artifacts can still be found throughout the spacious building. Across the parking lot from the main building stands a 4-story stone building also built in the 1840’s. The building was a flour mill that used water from the Erie Canal as its main power source. The water was brought down an open aqueduct, known as a raceway which was used to power the waterwheel. The remains of the raceway can be seen in the sheltered picnic are. The excess water was then discharged into a spillway which was adjacent to the building. Today the spillway still caries water under the Canal into an 18-mile creek and on to Lake Ontario. The building still in it’s original condition serves as the Lockport & Erie Canal Heritage Museum with hands-on canal related exhibits, a working model of a lock and many interesting and educational displays and artifacts.